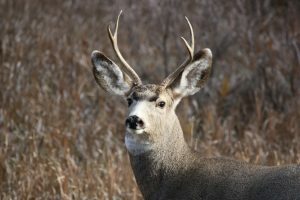 May 21, 2018 – Lander Elks Lodge #2317 is now accepting names of disabled veterans interested in participating in the annual Disabled Veterans Mule Deer Hunt. The Lander Lodge helps to facilitate getting disabled veterans into the field by completing paperwork on behalf of the veteran with Wyoming Game and Fish, receiving the donated hunting license, outfitting the veteran as needed, and taking them to accessible places that they can hunt. If you are a disabled veteran or know a disabled veteran who would be interested in this, contact Richard Gould at hitch_3r AT yahoo.com or call 307-349-4163. February 14, 2018 – Officers of Lander Elks Lodge No. 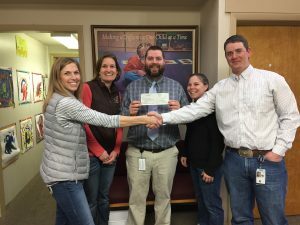 2317 presented a check for $1,500 to Child Development Services of Fremont County to aid in purchasing an integrated listening system for children with disabilities. Elks Care, Elks Share! Lander Elks Lodge No. 2317 conducts many community activities, but one the Lodge is especially proud of is the Disabled Veteran Deer Hunt. Since 2014, Lander Elks Lodge No. 2317 has put on this Hunt, and 2017 was a very successful year. Leading Knight and Veteran’s Service Committee Chair Richard Gould took Veteran Don Chambers out and they each got themselves a nice muley. 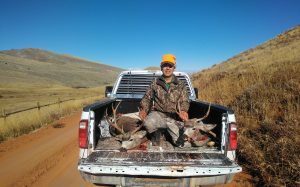 The Lander Lodge helps to facilitate getting disabled veterans into the field by completing paperwork on behalf of the veteran with Wyoming Game and Fish, receiving the donated hunting license, outfitting the veteran as needed, and taking them to accessible places that they can hunt. If you have questions about this program, would like to refer a disabled veteran for the deer hunt, or want to know how to put this event on for your Lodge, contact Leading Knight and Veteran’s Service Committee Chair Richard Gould here.